Bafana Bafanaâ€™s 2018 World Cup qualifier match against Burkina Faso is fast approaching and South Africans arenâ€™t buying tickets to watch the match. Ticket sales are so low, it is the lowest attendance to an official international match. 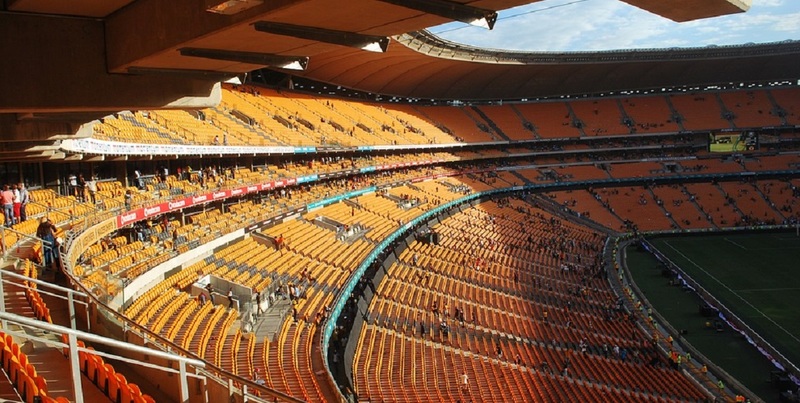 So far, the South African Football Association (SAFA) has managed to sell only 300 tickets for the 90 000 seater FNB Stadium. With such low ticket sales, SAFA has resorted to giveaways and prizes to fill up the stadium. Newspapers, TV stations, and radio stations were recruited to push tickets. Even a political party started its own campaign. Today, The Star newspaper was giving away two tickets with each newspaper bought on the street. We have tickets to the @BafanaBafana ðŸ‡¿ðŸ‡¦vs Burkina FasoðŸ‡§ðŸ‡« match for you…. Even the commander-in-chief of the Economic Freedom Fighters (EFF), Julius Malema, initiated a campaign to fill up the stadium on Saturday. The party is giving away a whole 1 000 tickets to learners and Bafana Bafana supporters. They published a statement urging South Africans to support its national team. â€œBafana Bafana has a great history of making us proud as a nation. It is not the time to give up on them. In fact, when they face difficulties, it is when we must raise the bar of our support even higher,â€ they said. @EFFSouthAfrica will be giving away 1000 tickets to learners and supporters in joburg, as part of the practical support to Bafana Bafana. Bafana Bafanaâ€™s poor performance is one of the reasons why people arenâ€™t coming out in full support. As one tweeter said, Bafana Bafana tickets should be free until they start winning matches. Soccer Laduma journalist Joe Crann told The Daily Vox Bafana Bafanaâ€™s poor performances are a reason why people arenâ€™t turning up to their matches. He said Bafana Bafanaâ€™s current situation has left fans disillusioned. The same team that won 2-0 against Nigeria suffered a double defeat against Cape Verde which gives fans nothing much to cheer about. â€œThe fans look at that and question their patriotism… â€“ that leaves a bit of a sour taste in the mouth,â€ Crann said. A caller on Kaya FM won two tickets to the game and allegedly turned them down. The taste must be really sour. Crann also pointed out that they didnâ€™t adequately market the match. The game is an important World Cup qualifier but was marketed as just another game. â€œPeople arenâ€™t given enough reasons to want to go. If itâ€™s just a football game, youâ€™re less likely to get people there than if you manage to create a full event out of it,â€ said Crann. One tweeter said Bafana Bafana should be the ones paying him to watch their matches. SAFA cut the ticket prices in half and offered those who had paid the full price a free beer at the stadium. Even with the changes, South Africans were still uninterested in attending the match. One person who had bought The Star gave back the free tickets. I bought the news paper but I gave the tickets back to the street vendor who was selling the paper. @BafanaBafana sorry we have had enough. Crann said the teamâ€™s coach Stuart Baxter had said his biggest challenge is getting the playersâ€™ confidence back. According to the EFF, the biggest source of moral support for football players are their fans. Bafana Bafana, potentially playing to an empty stadium, are going to have to dig deep to win back the confidence of South Africans. There are three World Cup qualifiers on Bafana Bafanaâ€™s schedule which they have to win. â€œItâ€™s fingers crossed really,â€ said Crann.